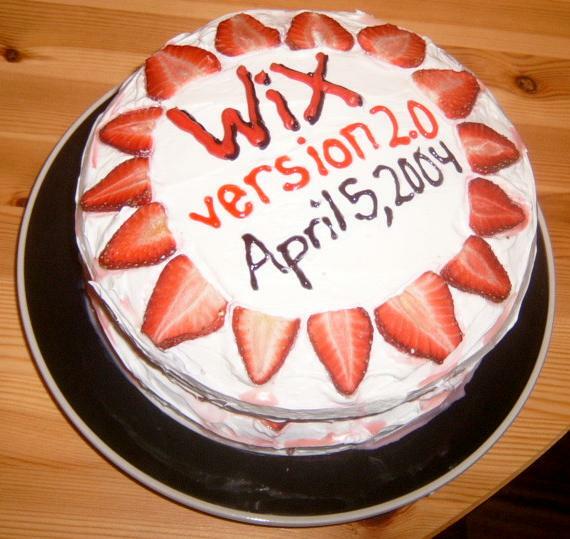 Today, four years ago the WiX toolset was released as the first Open Source project from Microsoft. Each year I like to take a moment and look around to see where we are. Just this week, I've found two random blog entries that make me believe we're being successful. Over the years I've slowly distilled the vision of the WiX toolset into a single sentence. "The WiX toolset enables all developers to create high quality Windows installation packages by providing tools that integrate seamlessly into the development process." I described the philosophy underlying that vision about a month after the WiX toolset's public release. There are three parts. First, the developer that wrote the feature knows best what needs to be authored into setup. Second, setup authoring is a part of the development process. Third, text files should be the only inputs into the build process. The first blog entry that I found at the beginning of the week aligns with the third part of the philosophy. The title of the blog entry is The Power of Text Files. Beyond the obvious agreement that "the best medium for code is a text file," I found the fact that the author had just recently tried the WiX toolset interesting for two reasons. First, it reminds me that there are a great many people that we haven't yet reached. Second, that the WiX toolset has generated enough interest that it is on developer's "to try out" list. Both of those observations mean we still have work to do on the WiX toolset. The second blog entry was a discussion about a talk at VSLive! San Francisco, titled: Multiply your team's voltage by working in parallel. This blog entry speaks directly to the second part of the philosophy and touches on the first part when mentions: "Code holds code artifacts - C#, VB, SQL, WiX, etc.". Notice that the WiX code (.wxs files) is called out as a peer of the C# code, the VB code, the SQL code. It is incredibly encouraging to see the setup coding not be relegated to the "etc. bucket" and actually called out as a first class citizen in the development process. Finally, I want to recognize Bob Arnson and Peter Marcu for their dedication to the WiX toolset over the last year. Anyone that hangs out on the wix-users mailing lists knows who Bob is, he fields an incredible number of questions. But what you don't often see is how much I depend on both Bob and Peter as a reliable and educated sounding board for new ideas and large decisions. Peter did an incredible job integrating all of the knowledge about patching spread across Microsoft into the new patching tool in WiX v3 called pyro. Over the last four years or so, Bob's and Peter's role in the WiX toolset has steadily increased and this last year they have really demonstrated solid leadership skills. With my April Fool's joke this year, some people asked the question about what would happen to the WiX toolset if I stopped working on it. With Bob and Peter available there is no doubt in my mind that everything would continue just fine. Google App Engine delivered to Windows by WiX.